This is a repost from last night because I want some opinions on the price. I'm asking $3500 and expecting $3000. Then some punk emailed me this morning with many ROFLs and LMAOs offering me $1000. I didn't take him seriously, of course, but he still made me wonder quite a bit if I'm pricing it correctly. The way I see it, this will make a great, quick project if you already have a $1200 shortblock in hand. 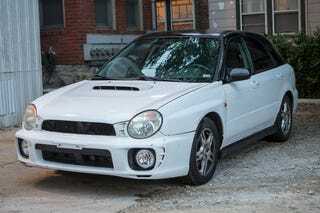 And for $4200, you have a running WRX with decent miles and a rebuilt transmission. It seems like a decent deal to me. But you're smarter than me. What do you think? Don't tell me what you'd pay for it. Tell me what you'd sell it for.